Are old seeds still good? When do you start seeds? Can you time Pumpkins for Halloween harvest? | Gardens Alive! Q. Are seeds from last year still good? There are no expiration dates on the packages…. And there are dates on your packages, Don! They should be stamped "Packed for 2006", or 2007, or whatever year the seeds were sold at retail. 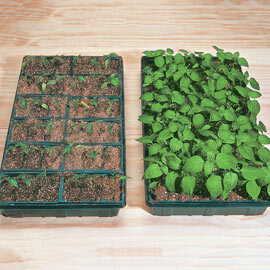 Seeds that are only a year old, or slightly older but whose packets are still unopened, generally germinate nicely. If they're several years old, the packs were opened and/or the seeds were stored in less than ideal conditions, subject them to a germination test. Place some sample seeds inside moist paper towels and slide the towels into a plastic bag. Mark the type of seeds on the front, but don't seal the bag. Let them sit out in the warmest room of your house and check them at day five and every day thereafter. Viable seeds should sprout by day ten. If they don't, or if less than a third wake up, get fresh seed. In the future, store excess seed in sealed glass jars to which you've added a few of those little moisture-absorbing desiccating pouches that come with vitamins and shoes. (The things that say, "Don't eat me!") And keep the jars in the room that best meets the '100 rule'; not in your always-damp garden storage area. 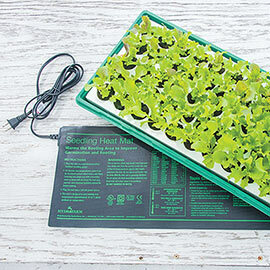 Q. Mike: When do you start indoor seedlings for spring planting outdoors? A. Basically, you want to allow about two months from the time you start the seeds indoors to the day you plant them outside. That's a week for the seeds to germinate, six weeks to grow strong stocky starts, and a week to harden them off before planting. The common advice is to begin two months before your area's "last average frost date"; that's the date, on average, when temps will stay above freezing. Your local county extension service can provide your local date, and the dates are pretty easy to find online. But 'averages' don't mean much when cold air sweeps down from Canada to say hello to your newly planted tomatoes a week after 'the book' says they shouldn't. And most of the plants we grow in our summer gardens—tomatoes, peppers, melons, beans, etc.—are tropical, and don't enjoy nighttime temps that dip below the 50s. So rushing the season can be a big, bad mistake. I personally start getting everything ready around the Ides of March, and make sure my seeds are all sown by April 1st for planting in the ground around June 1st (as opposed to my 'last average frost date' of May 15th). I urge my fellow Northerners to also be climactic cowards and start their seeds about 6 weeks before their last average frost date. 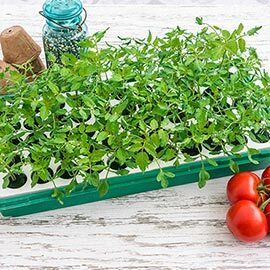 If you live in a cool clime and want early tomatoes, start two weeks sooner and be prepared to protect the young plants with hot caps and cloches their first couple of weeks outdoors. Maybe use a cold-hardy variety for the early crop as well. Down South, where the Canadian threat is much less, I'd say six weeks before your last frost date (provided you even have one!) would be fine. Q. I have about an acre and a half and have decided to plant pumpkins to sell as decorations around Halloween and Thanksgiving; some colored corn as well. When should I plant to harvest for Halloween and Thanksgiving? I have read about '90 day' and '120 day' varieties, but June or August seems a bit late, as we normally plant our garden crops sometime in April. Any advice you can give would be appreciated. A. Ornamental corn is easy; it keeps really well after it reaches the dry stage on the stalk, so you can start that crop as soon as the soil is nice and warm. And you should start it all at the same time, as the more plants you grow, the more corn pollen will be in the air at tasseling time and the more ears of corn you'll get. Those ears will be fuller too. Now, about those 'maturity numbers'. The "days to maturity" for crops that are direct seeded, like corn, peas, and beans, is what you might expect: The number of days from sowing the seed to picking the crop. So if the soil is warm enough when you start, your corn should be ready to pick pretty much when that number of days is up. And if you care for it correctly after picking, an August harvest will still look great in October and November. Ornamental corn growing tips: Try and have a big load of composted horse or poultry manure delivered, as corn (all corn, including the sweet corns) is a heavy feeder that craves lots of nitrogen (water and sun too). For drying corns (like your ornamental crop) wait until the stalks are completely brown and the colorful kernels are hard to the touch; then harvest during a long dry stretch. Never harvest drying corn when it's wet! Store the harvested cobs where they'll get good airflow to aid in their continued drying. And make sure to protect them from mice and other miserable munchers. Let's say you want to grow a 90-day pumpkin variety for sale to Halloweeners. People start buying their carving pumpkins around October 1st and are pretty much done acquiring them about a week before Halloween. So lets allow a week for the seeds to germinate, six weeks to reach transplant size, and roughly 13 weeks for those '90 days to maturity'; that's a total of about 20 weeks from the day you start the seeds to the day your first pickable pumpkins will be ripe. Pumpkins are a form of winter squash, and also store pretty well; so let's plan to start harvesting the crop around mid-September. Oh, and if an early frost threatens, pick all of your full-sized pumpkins and get them indoors. As with tomatoes, the green fruits ripen up nicely at room temperature.